Before I made the decision to get sober I did a lot of accidental living. Things would happen TO me; I only steered my ship some of the time. I thought I was being spontaneous, but now I see that it was less about that and more about learned helplessness. I didn’t believe that I had the power to make changes in my life. If something good happened to me– great –but I didn’t have much to do with it. The same with bad stuff. I was essentially giving my power away by being a product of my circumstances. This is living accidentally, or living without intention. Boozing fit in perfectly with this idea because it helped keep me stuck in those thought and behavior patterns for a long time. I used to put a lot of resources into drinking that I can now put elsewhere. There is so much space that boozing used to fill… time, money, thoughts, etc. Booze takes up space, there is no doubt about it. Even if you drink normally, it still takes up space that you could be using differently. For me, it took up WAY too much space. And now I am relishing the fact that I have SO MUCH FREE TIME. I am beginning with small goals. 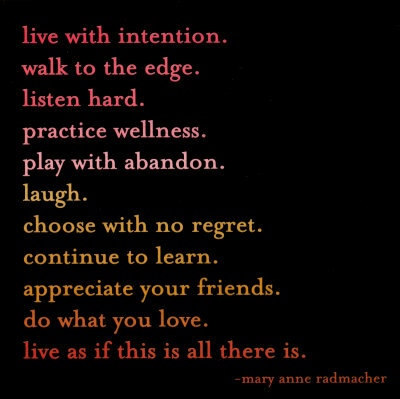 A few things that I can do/have been doing to live with more intention. Work everyday (for money). Write everyday (for me). Entertain once in awhile. Eat healthy foods. Cut down on sugar. Drink more water and green tea instead of Diet Coke. Keep up with my gratitude lists. Work on letting go. Get up and move instead of messing with the iPad. Look at each moment as an opportunity for SOMETHING instead of as time to fill. It is a luxury to have this time, and it is up to me to make it amazing. Love this. Accidental living…yes. Guilty of that. Lots to think about; thanks for this, Jen.